Denis O'Brien reports from Ballinamore, Leitrim. 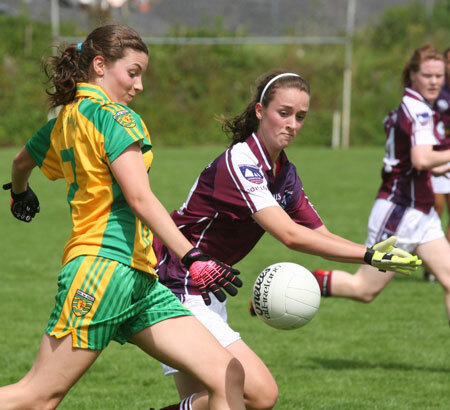 Despite a late flourish it wasn't to be Donegal minors' day as last year's All Ireland Champions had to give second best to a talented Galway outfit in the All Ireland Ladies A Championship Final at Ballinamore, Leitrim last Saturday afternoon. 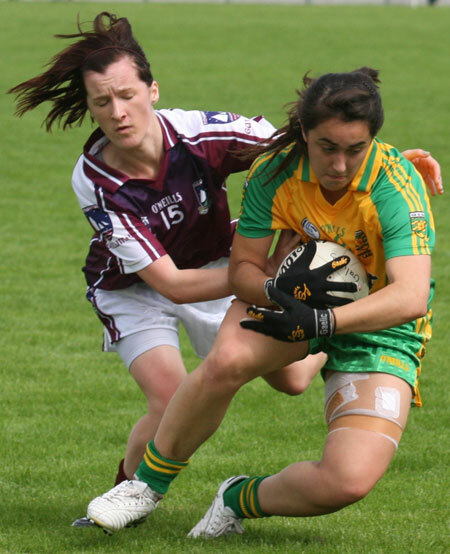 From the moment Donegal fell five points behind after Galway's inspirational midfielder, Dora Gorman found the back of the net on the 20th minute, the champions never really looked as if they could rein in the Tribe. 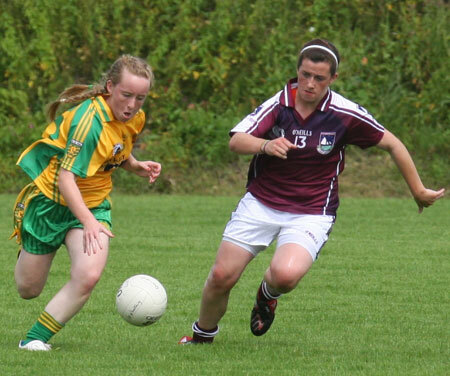 In truth, Donegal were all too dependent on Termon minor, Geraldine McLaughlin for scores as she accounted for all of her sides 0-5 in the first half and all but three of their scores overall. In contrast, Galway looked dangerous anytime they attacked. 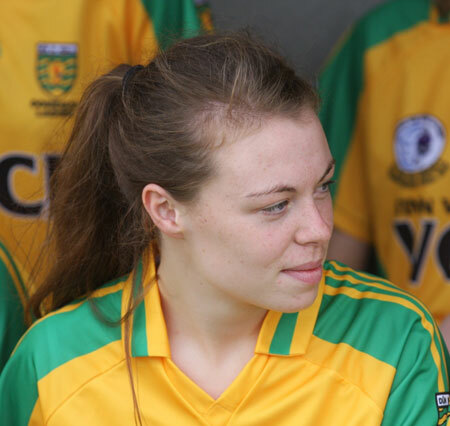 Their midfield, with the irrepressible Gorman linking up brilliantly with her half forwards, carved open the Donegal defence all too often. Such sorties more often than not ended in a Galway score. 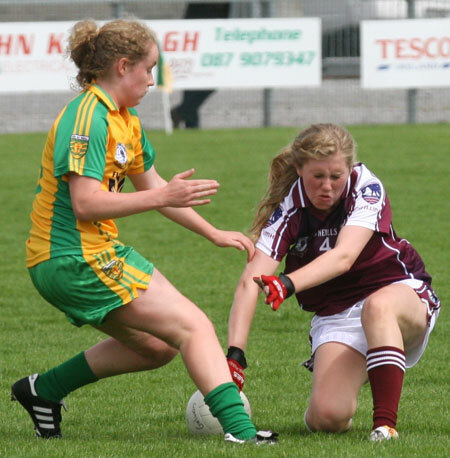 With a lively set of forwards, the Galway score board was kept ticking over all afternoon and with freetaker Lisa Leonard, unerring with 0-8 from frees, Donegal were always chasing the game. Donegal trailed by four at the break but still managed to stay with Galway and on two separate occasions had reduced arrears to three. Try as Donegal did to reduce arrears, the sharper Galway attack always seemed able to respond with a couple of scores to stretch the lead once more. 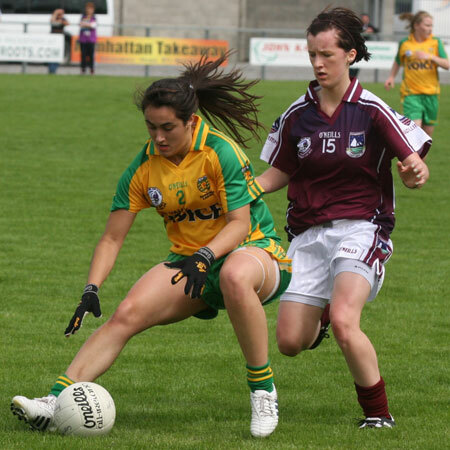 Donegal penetration upfront was being limited by a stifling Galway defense and with Geraldine McLaughlin still the only Donegal scorer by the 44th minute, it was hard to see how the northern girls could bridge the deficit. 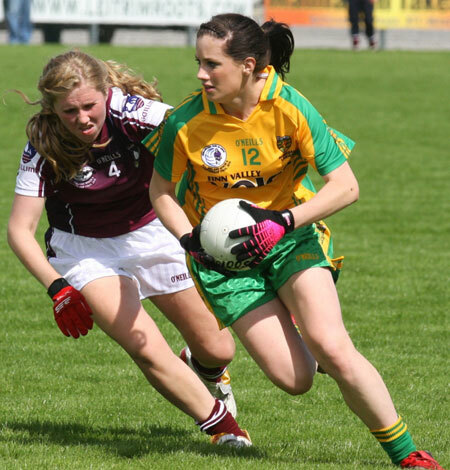 Donegal then had a breath of fresh air as late first half substitute young Rose Boyle changed the stats when putting over a fine point to leave the margin at five. 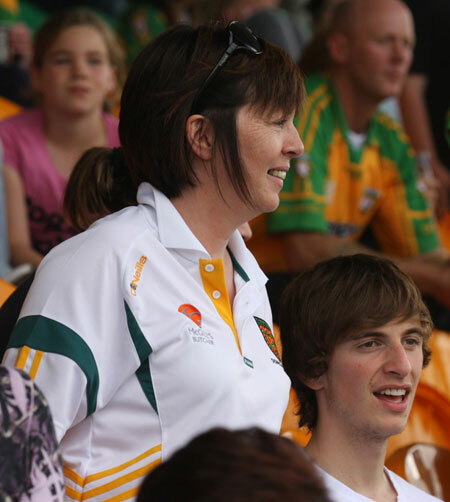 This gave the large Ulster following in the packed stand some hope, and, as Donegal were still battling, they were still very much in the game with just under 20 minutes remaining. 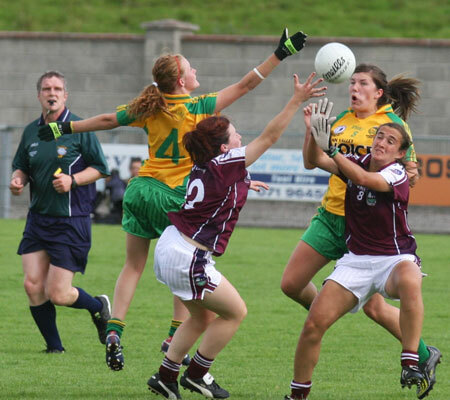 Ten minutes later after a pair of sin binnings for Galway midfielder Maria Connell and Donegal full back Tanya Kennedy a few moments later, Donegal found themselves in real trouble as suddenly a manageable gap had swelled to nine. The Tribe showing no mercy had put four points between the posts in quick succession with their influential midfielder, Gorman's point sandwiched between two frees from the accurate Lisa Leonard with a further lovely score from prominent wing forward, Tessa Mullins. 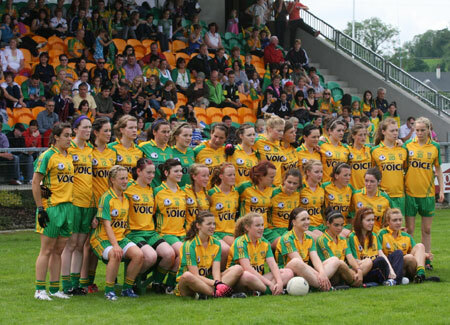 With seven minutes left to play, instinctively, the large Donegal following knew their minor girls All Ireland crown was slowly slipping away but yet the green and gold flags were heroines of '09. 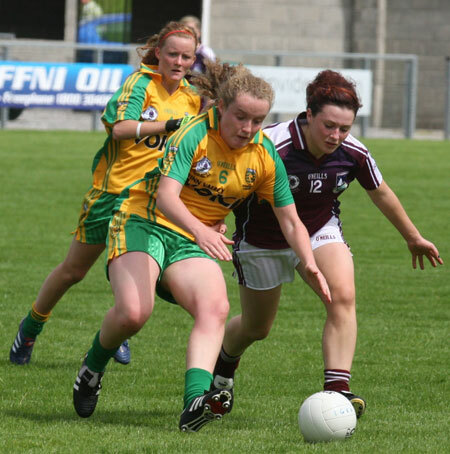 Driven on by the hard working midfielder, Niamh McLaughlin with good support from defenders Kayla Farren and Kate Keaney, Donegal were not about to give up without a fight. 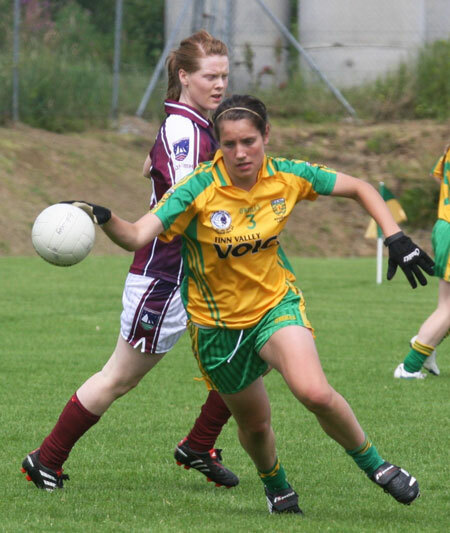 After good Donegal pressure that forced a free, the excellent Geraldine McLaughlin saw her effort hit the post before the ball fell to her again and she sent a missile hurtling on goal only to see her effort smash back off the cross bar. She made up for that a minute later when grabbing a point to reduce the gap. 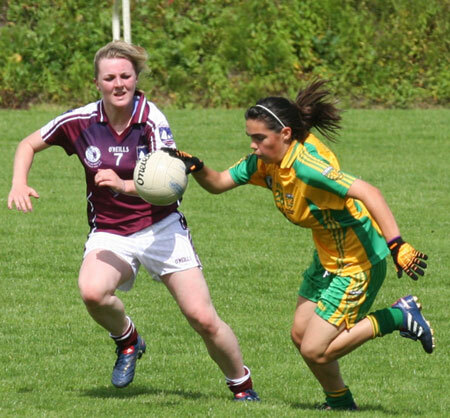 A moment before, full back Tanya Kennedy just returning from the sin bin had to have her wits about her when dispossessing Gorman who was bearing down on the Donegal goal. 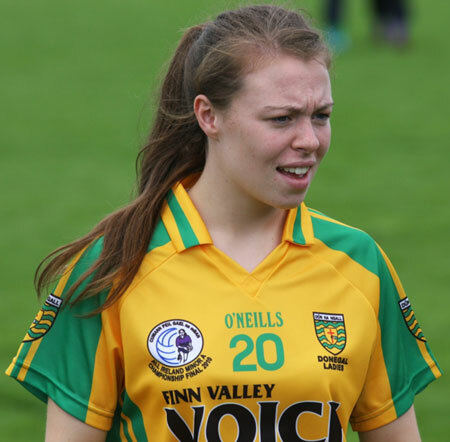 With time almost up, Donegal with a never say die attitude still battled on and were rewarded when Niamh McLaughlin reduced arrears in injury time with a fine point. 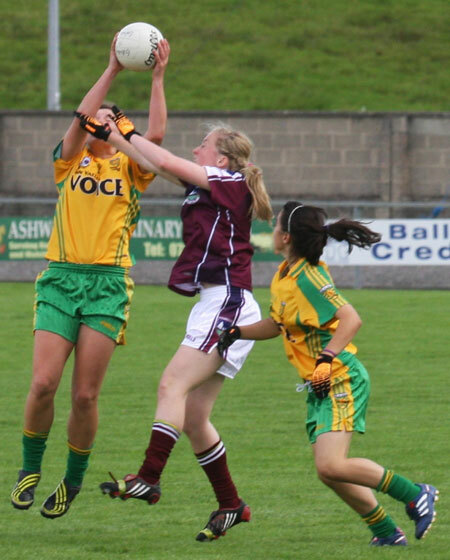 Further pressure on the Galway goal resulted in centre forward Ciara Grant forcing Galway keeper, Lisa Murphy into a good save but the Donegal player after more good work, fisted over the keeper into the net with Murphy having deemed to have gotten a touch. 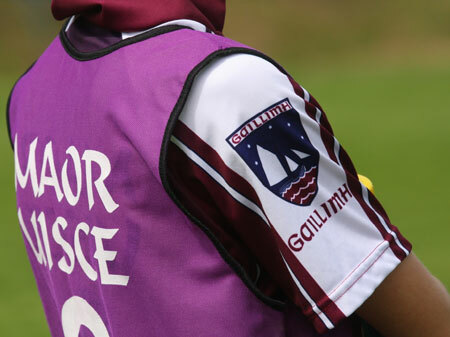 The margin was now down to four, however, despite Galway having another player sin binned just before the end of normal time, they held on with Donegal leaving it too late as the final whistle sounded soon after. As Galway celebrated beneath the stand, Donegal manager Kenny Griffin kneeling in the centre of the pitch surrounded by his young team, many with tears streaming down their faces, offered words of encouragement and later recounted those words to the Donegal News. "I told them that they are a brilliant squad and that it didn't go for us on the day but that's football." He added, "These girls have a long future ahead of them. There will be many a bad day but there will also be good days as they are a great squad of whom I am absolutely proud of." 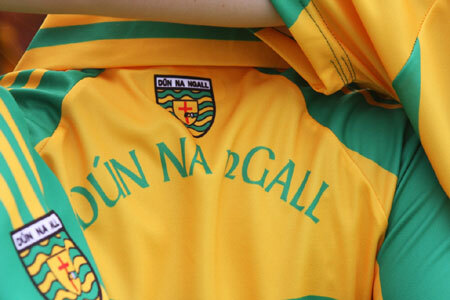 Donegal started brightly. 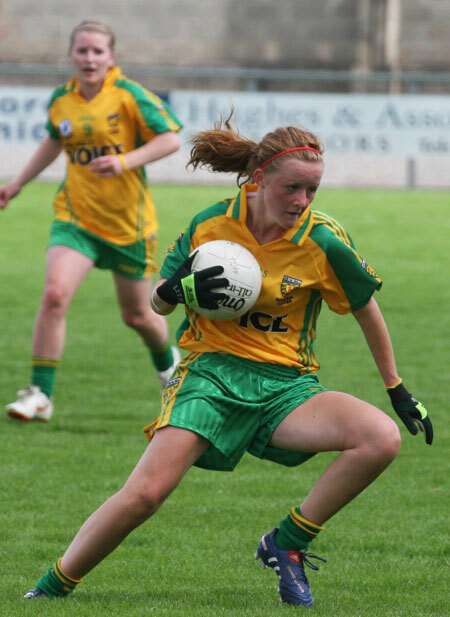 In the games opening minute, Donegal's first attack on goal, saw a flowing move that had its genesis in good work from midfielder Moville's, Niamh McLaughlin, finished with a Geraldine McLaughlin free to put the Tir Chonail ladies in front. 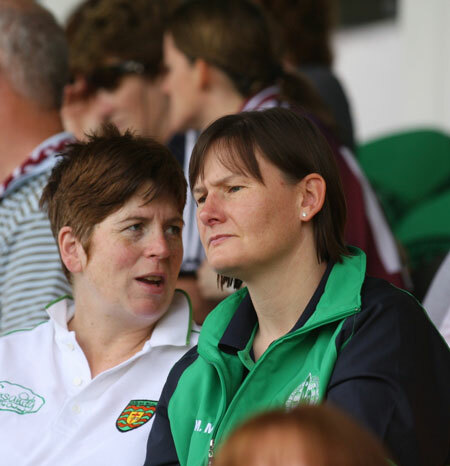 Galway responded with a free of their own after an enterprising run by Dora Gorman, before the lively and physically imposing full forward, Lisa Leonard shot another point to put Galway ahead at the 4th minute. 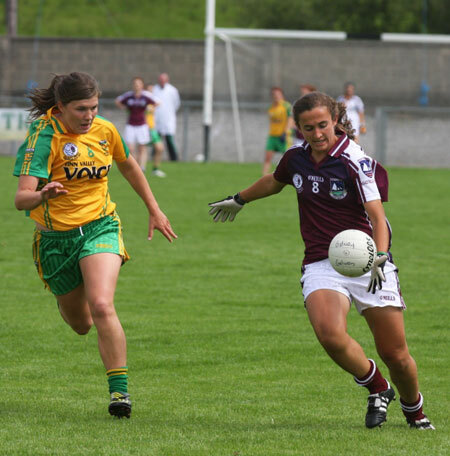 Though Donegal as yet, had equal share of possession in the middle sector, several attempts at breaking through the Galway half back line failed as the final pass lacked cutting edge, a pattern that worryingly developed as the game progressed. However, another McLaughlin free leveled the match in the increasingly sticky heat of the afternoon on eight minutes.For the next 20 minutes, it was all Galway. 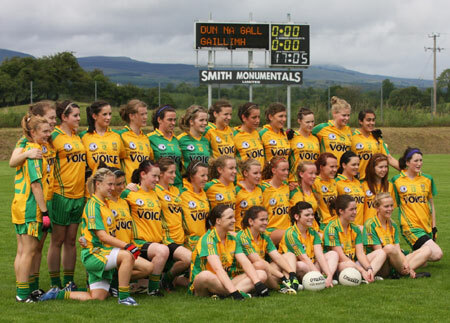 Points from Tessie Mullins and Leonard extended the lead before a blow to Donegal's dream of retaining their title was emphatically struck. 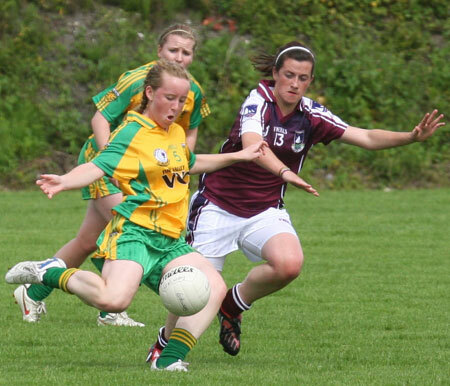 Gorman full of running, made herself available for a pass after Leonard had made all, and the tanned midfielder dispatched off the ground into the far left corner of the Donegal net.Donegal did have some scoring chances at their end but three wides in succession didn't help bridge the five point deficit and their cause was complicated with more uncharacteristic handling errors in attack. 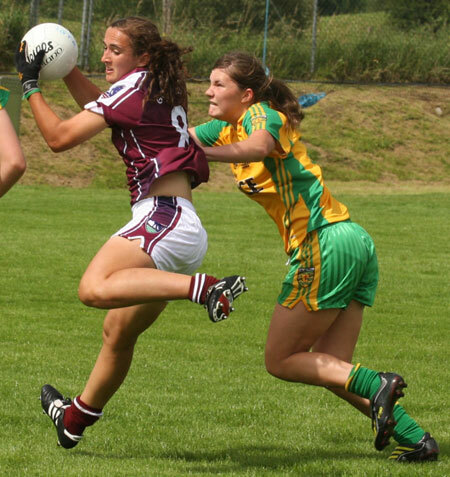 Leonard and McLaughlin swapped points before the Donegal girl took her second score from play before the interval. 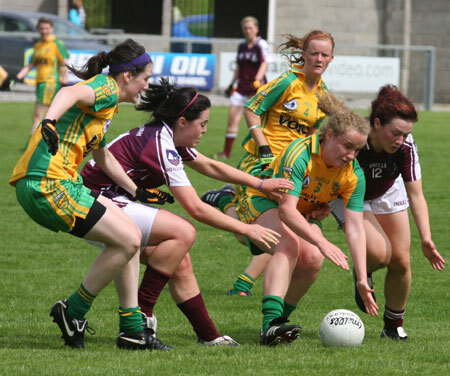 Donegal supporters were filled with hope when she reduced the gap to three after 40 seconds of the restart but as the half wore on Galway were always able to match the Tir Chonail ladies efforts with a score of their own. 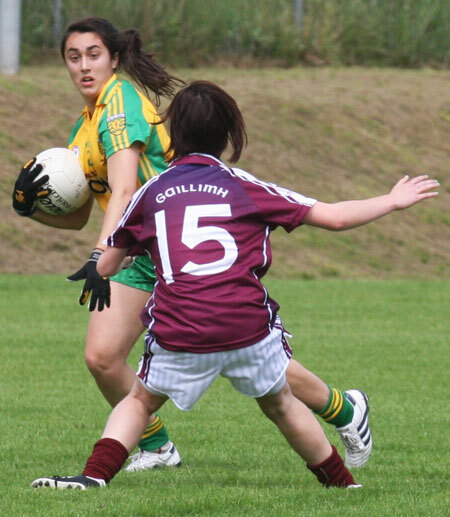 Apart from the opening 10 minutes of the game and the late flourish, little went right for a struggling attack on the day where young star Geraldine McLaughlin was left with too heavy a burden to carry. Had the late finish come sooner, things might have been different for the champions but it wasn't to be for Donegal and in truth the westerners deserved their victory. 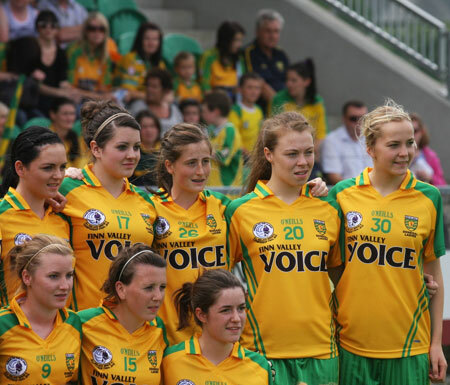 Niamh Mailey; Tara Khan, Tanya Kennedy, Orlaith Furlong; Kayla Farren, Kate Keaney, Niamh Friel; Ciara Hegarty, Niamh Mc Laughlin (0-1); Roisin Mc Donald; Ciara Grant (1-0), Alanah Mc Donnell; Emer Gallagher, Geraldine Mc Laughlin (0-9, 0-6f), Caoimhe Barrett. 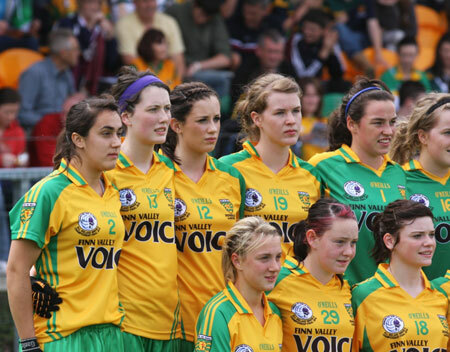 Substitutes used: Rose Boyle (0-1) for Barrett (28 mins); Maria Carr for McDonald (54); Catherine Boyle for Friel (55). 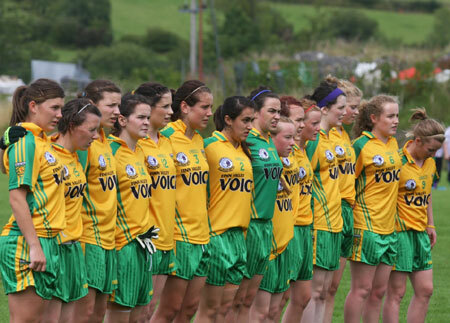 Lisa Murphy; Niamh Ryan, Sarah Lynch, Siobhan Divilly; Aoife Reilly, Becky Walsh, Amy Rohan; Dora Gorman (1-1), Maria Connell; Tessa Mullins (0-3), Deirdre Brennan, Charlotte Cooney (0-1); Michelle Burke (0-1f), Lisa Leonard (0-9, 0-8f), Eilis Gannon. 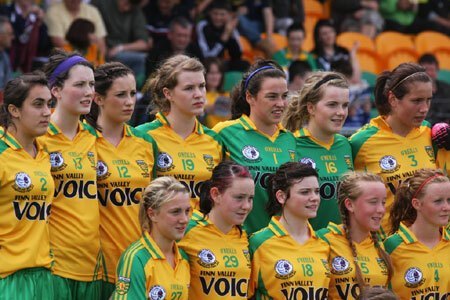 Substitutes used: Ciara Meagher for Ryan (36 mins), Tara Hession for Connell (Sin Bin, 55), Aisling Donnelly for Leonard (61). 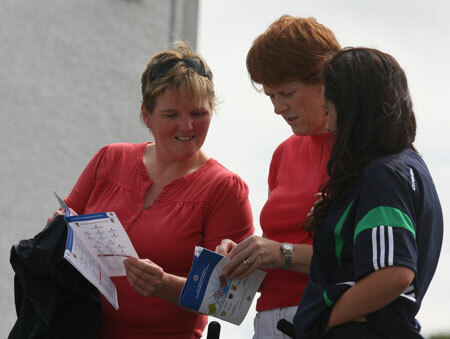 Report kind courtesy Donegal News.